First, check which version you are using. To do this click “Help” on the toolbar at the top of the RAP window and then select About from the dropdown menu. You will then be presented with a popup containing 4 tabs. Within the General tab, you will see the Version and Build of RAP that you are using. 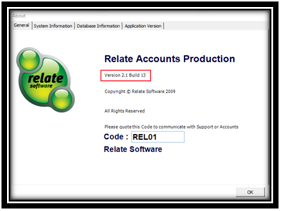 There are currently two builds of Relate Accounts Production. What build should I be on? If you have decided to early adopt the Companies (Accounting) Act 2017 you should be on Version 2.1 Build 16. 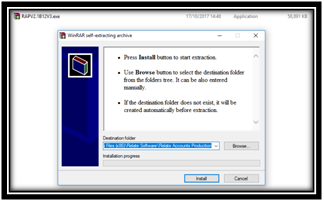 Click on the link and save the update file to your computer. 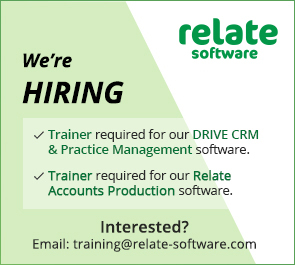 Before running the update, please make sure that Relate Accounts Production is closed and everyone is logged out. We also advise that you back up the database before running the update. Once you are satisfied everyone is logged out, double click the update file, select run and then select Install. Once the update has completed, the above window will close. When you try to log back in to Relate Accounts Production, the system will advise you that you need to update the database. Click update and allow the database update to run, this may take several minutes. Once the update is complete, you will be prompted to log back in to the software. The update should be run on each individual PC where Relate Accounts Production is installed. You will not need to update the database each time; you only need to run the update file. If you are on Version 2.0 Build 27 and are not early adopting the Companies Act (Accounting) Act 2017 or producing accounts for companies incorporated in Northern Ireland or UK you will not need to update.